The impressive victory of the left Social Democratic Party SYRIZA and the terrible defeat of the outgoing neoliberal government forces (New Democracy and PASOK) who had signed the memoranda,  is an important manifestation of the will of the vast majority of the Greek people to get rid of these detestable memoranda and their cruel catastrophic anti-worker and anti-social consequences. However, this change of government cannot get rid of the system that created them since they are the consequences of the acute economic crisis that hit the country a long time ago. During the election campaign, in fact, two lines of bourgeois management of the system and its crisis were put forward: a hard, neo-liberal line and moderate Keynesian one. The latter also recognised the odious nature of the loan agreements, the state of submission to the eurozone and the imperialist set-up of the European Union. Our position in these elections was, again, expressly abstentionist and clearly anti- parliamentary because our policy is revolutionary and our ideology, communist. Elections don’t change anything nor obviously do they change the capitalist system and free the world of work from exploitation, oppression and the sufferings produced by recurring economic crises. When parliamentarism is the system under which the bourgeoisie governs with the legitimate help of the oppressed classes, we do not intend to provide practical assistance with our participation. On the contrary, we will never abandon the idea that parliamentarism is the democratic form of the dictatorship of capital and the power of the modern state under any type of government, is the committee that manages the interests common to the most powerful faction of the bourgeoisie, particularly the financial oligarchy. In the election, the issue was about how to manage the deep economic recession and the particular question of an excessively high public debt. But the recession is by nature systemic, so the solution must be equally systemic. The crisis is the expected outcome of the internal contradictions of capitalism; excessive debt is just the particular manifestation of this crisis. Any alternative within capitalism is a scam. We have to overthrow capitalism itself and establish a social system based on economic collectivism, the socialisation of the means of production, the taking of power and the management of production by workers themselves, with planning based on social needs as well as respect for the environment. The new SYRIZA government with its partners, the right-wing nationalist ANEL (Independent Greeks) , hope to alleviate the ferocious repayment terms of the unsustainable debt – which cannot be repaid anyway – by seeking a "genuine compromise" with the creditors of the Troika , i.e. the representatives of international financial capitalism, in order to obtain some basic concessions for large sections of the seriously economically affected Greek population. It hopes to halt the rigid budgetary discipline and deflationary policies that led to the impasse in the euro area and to exploit the political cracks caused primarily by the rise of the extreme right of Marine Le Pen, who advocates France leaving the European Union. If one can imagine the EU without Greece, a European Union without the participation of France is certainly unimaginable. In any case, even if the new government can successfully relieve the most painful symptoms of the crisis, it certainly cannot provide a cure for the disease itself, especially in the international environment of globalised capitalism and ferocious neo-liberalism. Even a revived or moderate neo-Keynesianism, which is essentially the economic doctrine of SYRIZA, could only function at a pinch according to Keynesian theoreticians. Within a small economy reduced to its national borders it is pure fiction. The situation changed some time ago, because of the complexity and integration of markets and because of international capital movements. The fall in the rate of profit, already evident since the 70s, has led to a shift in investment towards the banking sector, a massive accumulation of fictitious capital, and the creation of a virtual financial economy which is very vulnerable when cash flows and speculative banking games are put in question. With the explosion of the crisis, European bourgeois governments have set up bank rescue plans to convert the banking debt into public debt and, ultimately transfer it to the people of Europe, whilst very cynically stigmatising the weakest among them as "pigs" and "parasites". Meanwhile, financial capital has "turned the crisis into opportunity" by speculating on the interest on new loans. The new German imperialist hegemony, based this time on the economic advantage offered by Reunification, has converted the countries of the South, particularly Greece, into scapegoats by unleashing a false and defamatory campaign against them. It has led to excessive humiliation of these peoples, citing the traditional sado-masochistic Protestant ethic which had already provided the ideal moral justification for mercantile capitalism. The truth is a long way from what the quasi-pietist neo-liberals in Berlin and Frankfurt and their moralising sermons maintain behind their rich purses and great hypocrisy. The money that the German Government provides to Greece is not from tax revenues and therefore does not increase the fiscal pressure on German taxpayers. 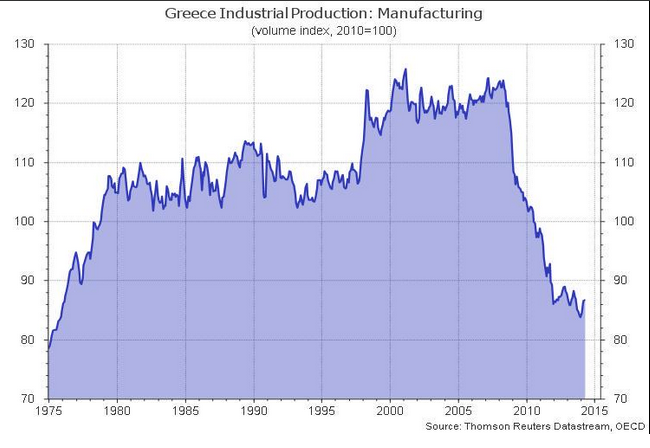 It borrows directly on the market prior to lending to Greece at a higher rate, at a profit on it. Germany, like every good creditor, is not stupid enough to invest money in a "black hole." With our German comrades of the Gruppe Internationaler Sozialistinnen (the International Socialist Group), we took the internationalist initiative of addressing German workers several times to expose this chauvinist propaganda, revealing the lies of the German bourgeoisie and warning them that in the fate of the Greek and Southern European workers and unemployed of today, they can already see their own future. In any case, the rapid changes that are tearing Europe apart require the internationalist unity of the working class and its struggle for the overthrow of this system that feeds on the monster of austerity, unemployment and social exclusion. The above document is translated from the French version of the original document on the comrades’ Greek website Engymo. The Gruppe Internationaler Sozialistinnen is the German affiliate of the Internationalist Communist Tendency. The document has been distributed bilingually in Germany. The various Memoranda from the EU etc are the agreements by which austerity was imposed on Greece. ANEL or the independent Greeks are a right wing party (In Europe it sits in the same group as the British Conservatives) anti-immigrant and nationalist party which agrees with SYRIZA that the bailout has to be renegotiated and announced before the election it has ready to form a united front with anyone against the current deal. It has 13 MPs and SYRIZA 149 giving Tsipras a clear majority in the Greek Parliament. Its leader Kammenos, who is openly anti-semitic, has been made Defence Minister. The Troika (triumvirate) are the International Monetary Fund, European Central Bank, and European Commission which have imposed the various memoranda on Greece. What more is there to say? Doesn't this say it all and clearly too? We have to overthrow capitalism itself.